Once again we had a very successful event with 1st Middleton Scouts taking away all the trophies. Unfortunately this may well have been the last District competition. With the merging of Districts later this year the new District may simply be too big for us to hold a swimming gala like this again. Our Scout team once again took part in and completed the 12 mile Peeler Hike. This event requires good map reading skills and a high level of fitness. The weather on the day was quite good but the previous week had been hit with heavy rain so there was a lot of deep mud and also sections of flooded footpath to get past. We chose to celebrate St George's day with another big weekend event. 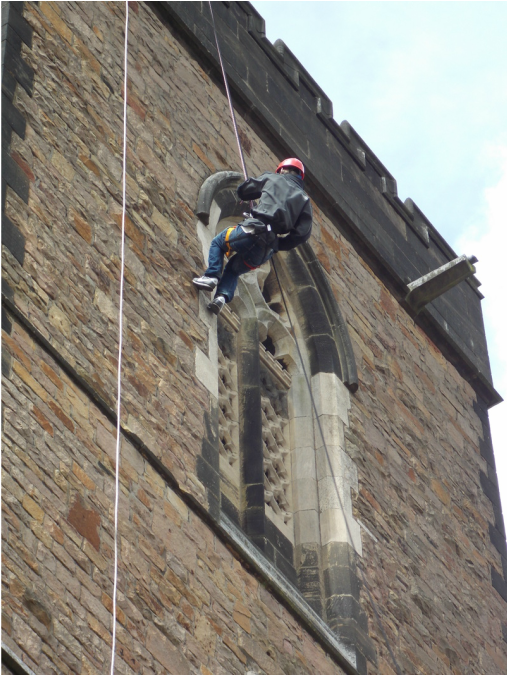 We took part in the charity abseil arranged by Royton Scouts, with lots of our Troop taking part in the 100 foot drop down the side of the church. Ryan was using this event to help raise funds for the Jamboree trio to Japan next year. Later on that evening we had a BMX session at the velodrome, followed by a night hike to Tandle hill with the Scouts eventually getting back to the HQ in Alkrington at about midnight. The next morning we got up, made breakfast, made small compass keyrings, had a go at slack-lining then ironed our uniform and walked down to the church to take part in the St George's day service and parade. We entered two teams into the Gaddum Shield event this year. The weather was lovely and as usual the Scouts had a lot of fun completing the challenges. We met up at Heaton Park to help out as part of our Community challenge badge work. Our job was to do a "balsam bashing" session. Himalayan Balsam is a pretty but aggressive and fast growing plant that s starting to take over much of the UK's hedgerows and waterways. The seed pods explode if touched by a person, animal or even raindrop, sending seeds flying up to 20 metres away. The Scouts had great fun uprooting vast swathes of the plant, learning lots about the plant life. The Heaton Park staff were excellent and really looked after us. In return for our work they are allowing to have a sleepover event later this year in the Park. The manager and staff at the Middleton branch of The Royal Bank of Scotland allowed us to spend the day in the bank fundraising for Ryan's trip to the Jamboree next year. Lots of the staff even made and brought cakes for us to sell. Once again our whole group got together at Ashworth Valley. Each section did their own activities during the day, coming together in the evenings for a campfire and wide games. We spent several months restoring an old trek cart that was slowly gathering dust and rotting away. After rebuilding some sections, sanding off all the old paint, undercoating it and repainting it we finally had a cart to use in our activities. We finally got to use our newly refurbished trek cart and walked from Alkrington HQ, using the cart to carry our kit, to Heaton Park. We were allowed to use "the temple" up on the hill to sleep in. When the park closed we had the entire place to ourselves. We played games, used a telescope to look at the surrounding landscape, cooked food on disposable barbecues then went for a walk in the dark. In the morning we had breakfast and set off home with our cart. ​It was on this camp that the Scouts found the back half of a sea rabbit and challenged the Leaders to preserve the feet and some skin/fur. So now two of our Scouts have "lucky" rabbit's feet hanging on their rucksacks, another has a rabbit tail and a fourth has a rabbit fur woggle! We repeated our trek cart expedition for those that couldn't make the first event. Several of our Scouts took part in the annual Jamboree of the Air and Jamboree of the Internet at County HQ and spoke to Scouts from all over the world. We held our annual camp at a new site for us - Bowley, and ended up unexpectedly sleeping in the tepees instead of our tents! We had a long hike on the Saturday and while walling along the river found the blades from an extremely expensive kayak paddle. There was a phone number just faintly visible on one blade so we left a message and took them with us in case we could return them. A few days later we heard back from the owner who was delighted to get them and turned out to be a Scout Leader from another County. We took part in the Walking with the Wounded "Walking home for Christmas" event. On a misty and later quite rainy day we took the trek cart from Heaton Park to the HQ in Alkrington where where we had a chinese takeaway before going to bed. The next morning we loaded the trek cart with donated toys for the toy parade at church and walked up to St Leonards for the service. We had our annual 1 night Winter Solstice camp at Middlewood but were again disappointed by the black of snow. We used the parachute shelter as the base of our camp and most of the Scouts slept in hammocks.